An AWESOME modern fit on a budget. Very similar to American Apparel but at a better cost. 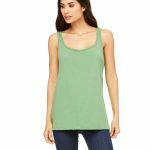 This tank features the super soft triblend fabric by Bella+Canvas. It’s our most popular tank top with gyms, crossfit gyms, bars, and more.